Co Primes : H.C.F. of two numbers in one set should be 1. > If a number N is divisible by two numbers a and b, where a, b are co primes, then N is divisible by ab. 24 is divisible by 2 and 3 where 2,3 are co primes, then 24 is divisible by 6. 36 is divisible by 2, 4 where 2, 4 are not co primes, so, 36 is not divisible by 8. >If a number N is divisible by another number M, then N is also divisible by the factors of M.
72 is divisible by 12, 72 is also divisible by 2, 3, 4, 6. because 2, 3, 4, 6 are factors of 12. > If a number N is divisible by prime factors of M, then N is also divisible by M.
63 is divisible by 3 and 7, 63 is also divisible by 21 , because 3 and 7 are prime factors of 21. Read about Prime Factorization here. Every integer is divisible by 1, so no rules are needed. Ex: 3 is divisible by 1, 4573842 is divisible by 1. The last digit must be even number i.e. 0, 2, 4, 6, 8. Ex : 3456 is divisible by 2 –> last digit i.e. 6 is an even number. 343423 is not divisible by 2 –> last digit 3 is not an even number. The sum of digits in given number should be divisible by 3. This is easy method to find numbers divisible by 3. Ex : 3789 is divisible by 3 –> sum 3+7+8+9= 27 is divisible by 3. 43266737 is not divisible by 3 –> sum 4+3+2+6+6+7+3+7 = 38 is not divisible by 3. The number formed by last two digits in given number must be divisible by 4. Ex : 23746228 is divisible by 4 –> 28 is divisible by 4. 674235642 is not divisibility by 4 –> 42 is not divisibility by 4. Last digit must be 0 or 5. Ex: 42340 is divisible by 5 –> 0 is last digit. 675564 is not divisibility by 5 –> 4 is last digit. The number must be divisible by 2 and 3. Because 2 and 3 are prime factors of 6. Ex : 7563894 is divisible by 6 –> last digit is 4, so divisible by 2, and sum 7+5+6+3+8+9+4 = 42 is divisible by 3. 567423 is not divisible by 6 –> last digit is 3, so not divisible by 2. No need to check for 3. 1. 343 is divisible 7 –> 34 – (2*3) = 28, 28 is divisible by 7. 2. 345343 is given number. 3 is last digit. Subtract 2*3 from 34534. 34534 – (2*3) = 34528, we cannot tell that this result is divisible by 7. So, we do it again. 3452 – (2*8) = 3436, we will do it again. 343 – (2*6) = 331, we will do it again. 33 – (2*1) = 31, 31 is not divisible by 7. So, 345343 is not divisible by 7. Don’t forget to check the generalized rule at the end. The number formed by last three digits in given number must be divisible by 8. Ex : 234568 is divisible by 8 –> 568 is divisible by 8. 4568742 is not divisible by 8 –> 742 is not divisible by 8. Same as 3. Sum of digits in given number must be divisible by 9. Ex : 456786 is divisible by 9 –> 4+5+6+7+8+6 = 36 is divisible by 9. 87956 is not divisible by 9 –> 8+7+9+5+6 = 35 is not divisible by 9. Last digit must be 0. Ex : 456780 is divisible by 10 –> last digit is 0. 78521 is not divisible by 10 –> last digit is 1. Form the alternating sum of digits. The result must be divisible by 11. Ex : 416042 is divisible by 11 –> 4-1+6-0+4-2 = 11, 11 is divisible by 11. 8219543574 is divisible by 11 –> 8-2+1-9+5-4+3-5+7-4 = 0 is divisible by 11. The number must be divisible by 3 and 4. Because (3* (2^2)) are prime factors of 12. Ex : 462157692 is divisible by 12 –> last 2 digits 92, so divisible by 4, and sum 4+6+2+1+5+7+6+9+2 = 42 is divisible by 3. 625859 is not divisible by 6 –> last 2 digits 59, is not divisible by 4. No need to check for 3. 1. 4568 is not divisible by 13 –> 456 + (4*8) = 488 –> 48 + (4*8) = 80, 80 is not divisible by 13. 5937737+ (4*0) = 5937737, we cannot tell that this result is divisible by 13. So, we do it again. 593773 + (4*7) = 593801, we will do it again. 59380 + (4*1) = 59384, we will do it again. 5938 + (4*4) = 5954, we will do it again. 595 + (4*4) = 611, we will do it again. 61 + (4 *1) = 65 , 65 is divisible by 13. So, 593773622 is divisible by 13. The number must be divisible by 2 and 7. Because 2 and 7 are prime factors of 14. The number should be divisible by 3 and 5. Because 3 and 5 are prime factors of 15. The number formed by last four digits in given number must be divisible by 16. Ex : 7852176 is divisible by 16 –> 2176 is divisible by 16. Follow the similar examples given in divisibility by 7 and divisibility by 13. The number should be divisible by 2 and 9. Because (2*(3^2)) are prime factors of 18. The number formed by last two digits in given number must be divisible by 20. Ex : 2374680 is divisible by 20 –> 80 is divisible by 20. 456215789654824 is not divisibility by 20 –> 24 is not divisibility by 20. To check divisibility by a number You should check divisibility by highest power of each of its prime factors. Remember that the divisibility by any two of the factors of a number is not sufficient to judge its divisibility. 1. Suppose you are checking for divisibility by 12. 2,3,4,6 are factors of 12. You cannot say that the number is divisible by 12 by checking divisibility by only 2 and 4 or 4 and 6. You should check divisibility by 3 and 4 to tell the divisibility by 12. Because 3 and 4 are prime factors of 12. 2. Now, we are checking divisibility by 18. Prime factors of 18 are (2*(3^2)). So, you should check divisibility by 2 and 9 . don’t check for just 2 and 3 and also don’t check for 3 and 6. Basically prime numbers have factors 1 and the number itself. So, we can’t this rule apply for prime numbers. This is only for composite numbers. So, this rule counts for prime numbers which have been missed in previous rule. To test divisibility by a number N which ends in 1,3,7,9 this method can be used. Multiply N with any number to get 9 in the end. Add 1 to the result and divide it by 10. Store the above result as R.
We are checking whether a number X is divisible by N or not. X is divisible by N, only if Rz + y is divisible by N.
Find whether 645 is divisible by 23 or not. N =23 ; 23 * 3 = 69 ; so now N has 9 in the end. 99 is not divisible by 23. So, 645 is also not divisible by 23. Let us find 585 is divisible by 39 or not. N =39 ; so now N has 9 in the end. 78 is divisible by 39. So, 585 is also divisible by 39. 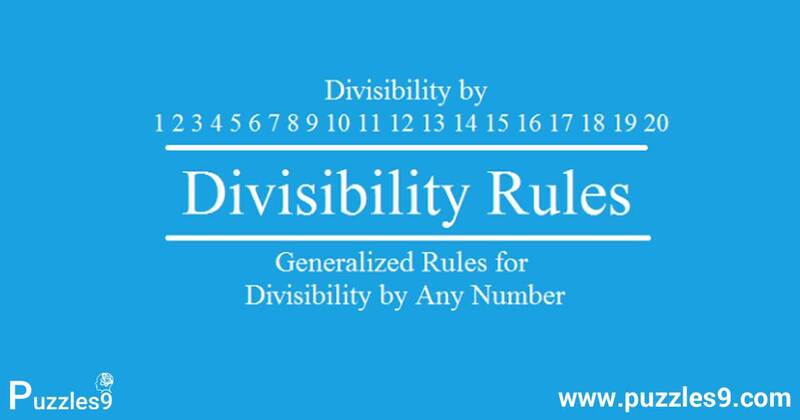 Final Note : These math division rules are extremely useful to perform quick divisibility test in any competitive exam. Also, remember the generalized rules for division.